All work and no food was not an axiom as we focused on GNH last week. Tashi prepared a fabulous Bhutanese dinner. 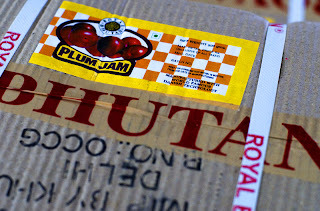 Recipes to follow but first you must know that Bhutanese food is muy spicy. The recipe, I think, may not be adjusted for western taste - will leave that up to you. 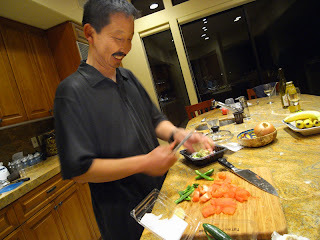 Tashi told us that on a 1-10 scale the dishes he prepared for us were . 5! The following is a marvelous sauce that can be spooned over jasmine rice, or sauteed veggies or even eaten as a soup. It is sooooo good. Put chilies, mushrooms and onions in a pot of water approximately a half litre). Add the veg oil and boil for about 10 mins. Add tomato, garlic and cheese and boil for another 2 mins. Stir. Take off heat and keep lid on for 2 mins. If one's life is simple, contentment has to come. Simplicity is extremely important for happiness. Tashi has been here since Thursday afternoon. We began work, after a good trek on a desert trail, in earnest on Friday morning. 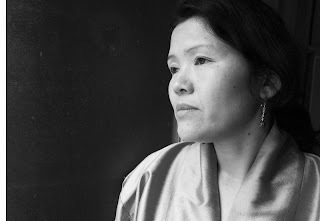 The work at hand is for Tashi is finding super quotes relating to GNH and its philosophy and matching them to images. My work has been to edit and edit and edit images. I will post next a sample of what we are coming up with. The little ears are Eddy's. I cant vouch for his contribution to the project but he does remain ever eager to aid. 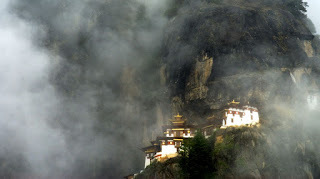 Fading and appearing the the mist like a Bhutanese Brigadoon is Takshang Monastery. 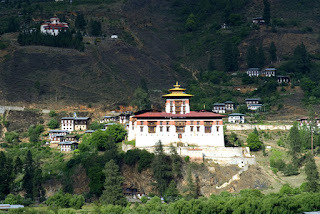 I have saved it for the last post in this 6 month long focus on Bhutan. The pleasure of the trek up the approximate 3000 ft to the monastery perched on a sheer cliff face at 10,299 feet was what I saved for myself as a last day treat. As you see, the day was misty and quite often more than that, so it was a fresh way, not to hot and thereby not too tiring. Along the way we, Tashi, Ugyen and I, stopped at a little tea house for this view then proceed on up the steady switch backs. Somehow the file with the rest of the pictures - exterior was all that was allowed - was lost. It is just as well. For me the whole thing was indelible. For you, you must go see for yourself. 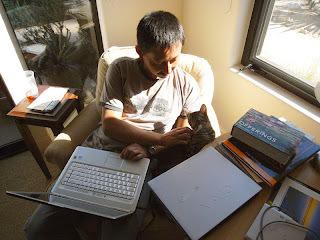 Tashi and I will begin pulling this all together for the book next week. 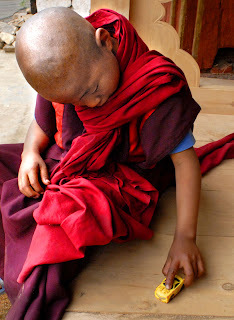 Next week the focus will be not so much on these pictures as the point of view of GNH. As these points become clear I will post a few favorites for you. 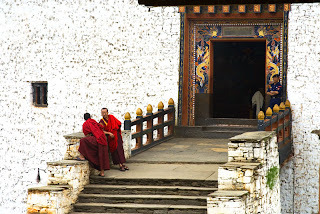 The Paro Dzong is caught by strong sunlight on a day threatening rain, a couple of monks hang out at the massive entrance and within three young monks go about their duties. 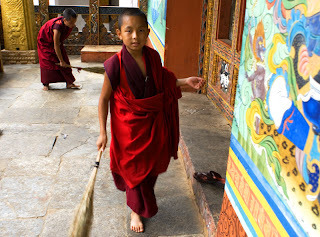 Just as schoolchildren throughout Bhutan tidy up the school before the day begins, these little monks at the most important Punakha Dzong do the same. Think I am partial to mamas and kinder! 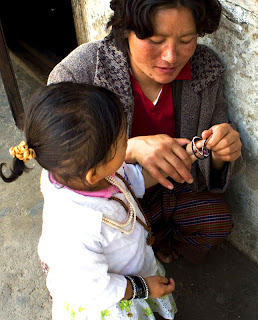 This mama just bought her little girl a bracelet at the Paro market. If you click on the image you can make it bigger and see that her arms are filled with little bracelets. Little bracelets, big love. 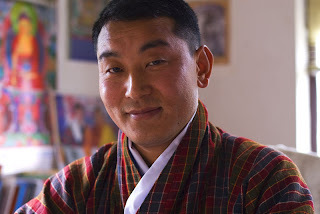 There are many, many outreach programs that Dorji is responsible for. The one that I became most familiar with is the center- with dormitory capacity - in Punakha that provides the rural girls with few opportunities with the skills that will afford them a living. 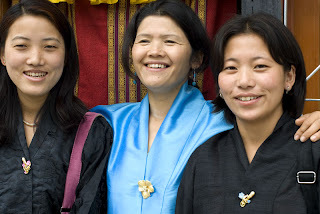 The first image is of Dorji with 2 graduates from the center. The girls had just returned from Bangkok, their journey and studies there a gift from a supporter in Thailand, with samples of the crafts that they had learned there. The girls, who without this organization would be as yet dependent, were glowing with confidence and exuding happiness. The next pictures are of girls waiting in front of the YDF office on interview day. They were all hoping to qualify for admittance into the program. One of the girls that Dorji is speaking with in the second image was telling, when asked, about her journey, largely on foot, to Thimphu for the interview. She had walked for four days. She volunteered that, yes, she had been frightened during the nights, of bears and tigers. The anxiety in the fourth image should be easy to pick up. 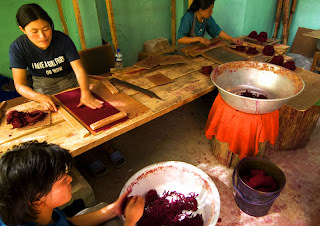 The last pictures are of girls at the center standing in the doorway to their dormitory and at work in the center's sewing room. The above is a picture of the most beautiful, deeply sincere woman who heads the Queen's Youth Development Fund, an agency dedicated to the welfare of youth and particularly that of underprivileged youth. Her name is Dorji. While I have sent Dorji a print of this image, I actually did not expect her to like it very much. You see, this is a vibrant, sparking woman and, to her, this picture may look a little off. Understandable. What I see, however, and appreciate tremendously is the acknowledgment in her gaze of how much compassion is, indeed, called for in this world. This lovely woman ( and we will see a smiling, laughing picture soon ) is doing her part towards addressing the needs of children and it is a huge part that she is doing. 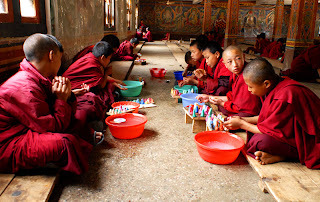 It appears as if the little monks are playing with Sculpty clay but, in fact, they are making small religious icons. 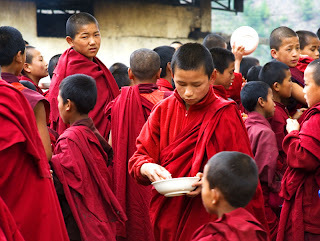 The first image is the gathering of the little monks for their lunch - heaping bowls of rice topped with chilies, a few vegetables and chicken. The monk directly above hold his small reed flute. 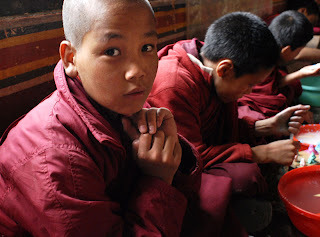 Early on in this posting we visited the monastery for the young monks. Here is a revisit with some more images. 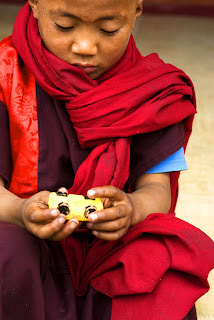 My mind created an entire story around this little, little monk. 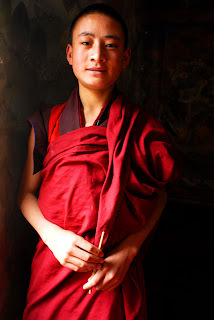 He was, when I came upon him, sitting well apart from all of the others on some steps to a large prayer wheel. 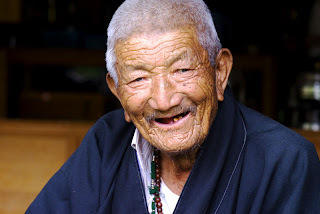 The prayer wheel, high above the monastery, was being turned repeatedly by a rather old and fairly frail man. Neither spoke or exchanged eye contact with one another or with me. The man, I assumed was deep in prayer, the boy, I imagined, was deep in melancholic memory. 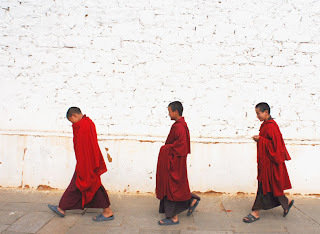 My hunch is that he had not been at the monastery very long at all for his mood, while definitely solitary did not seem to be that of a boy on the other side of a spat with a buddy. Was he a new wee monk? Was the little car all he had from what and who he had recently parted from? A moment of a question only. 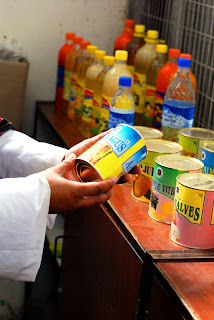 Above are some of the products that the AGRO project processes. This business demonstrates the GNH point of view in business perfectly. It is reality vs rhetoric. Maintaining their we not me ethics they have not only refrained from asking for government assistance but have increased their capacity, on their own, to help the farmers. The income from the bottled water produced a "sushion" so they could subsidize the farmers when needed. Their mission is the answer to "Why are we here?" They are clear on this: to make sure people have work, food and are happy. Orange growers formed co - ops with AGRO's aid to make fruit juices to sell, consume and export. 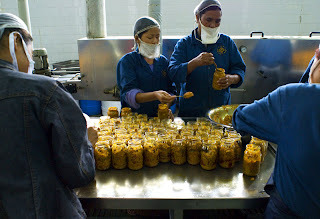 They formed units of ARGO locally where the oranges are grown so as to diminish shipping cost and waste. AGRO philosophy is that the work environment needs to ve friendly, trusting, self motivated with each person's job deemed as vital to the whole. 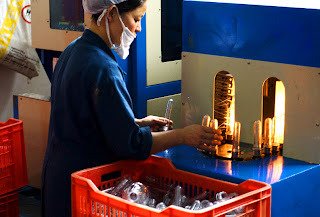 As for AGRO's footprint in the world, they have factored in positions in far flung areas where the workers sole responsibility is to crush ( and teach others to crush ) plastic bottles These bottles are then packaged and the plastic is sold to neighboring India. 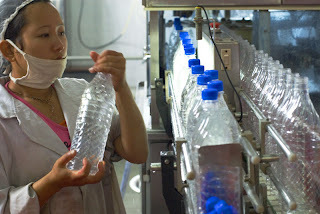 Ultimately the production of bottled water is helping many people. The manager of AGRO says: clearly this is charity beginning at home. He also says and can happily demonstrate: SEE, SELFLESSNESS WORKS. On the bigger business side you have an example of Bhutan Agro Ministry pilot project for food processing, fully funded b y a Danish entity. 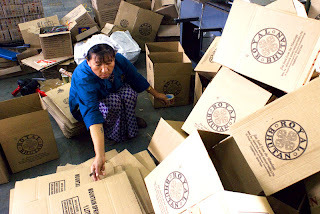 As an operation based entirely on the GNH precepts, plant operates for the benefit of farmers and as such is set up to help and educate people in agriculture as well as production and sales. Farms are far flung in the small country. 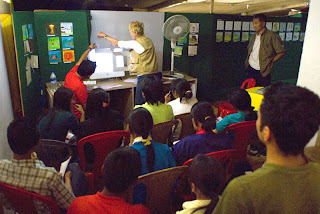 The educational efforts are accomplished largely by word of mouth and radio programs. Individual farmers bring their produce, largely fruit, and get a fair price. This can often result in a welfare aspect. The management believes that they must take the risk to help the farmers even if it is out of their budget. They feel they must, on their own initiative, take the risk to help the people who need it. The Crown Prince, soon to be monarch, intends to place a great deal of emphasis on the sustainable economy aspect of Gross National Happiness. Already in place in the larger towns are a significant number of small business men and women with thriving operations. 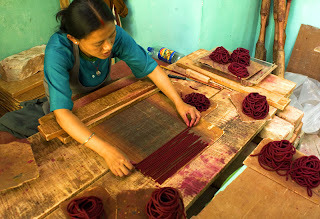 The one above, an incense " factory" takes place in a small, rather dark, room in the back of a family house. I have a girlfriend on WOW. Throughout this blog coverage we have looked at various schools. 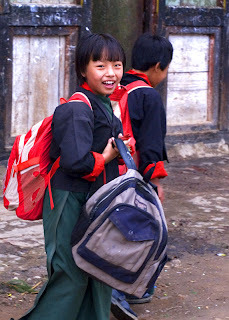 While education is of great importance in this developing country, getting to school in rural areas is quite often a serious challenge in the rural areas. Above you see the truck transportation for older kids. 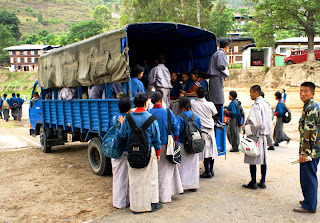 Generally the kids have walked quite a distance in order to arrive at the pick up point. The country, at the start and end of the school day, is a virtual parade of little ones like the girl about. And there are those books again! What a load, what a happy little girl! 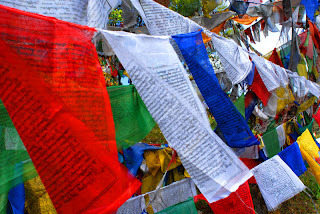 Few of us westerners and unfamiliar with prayer flags. What I learned about them, however, may enhance your enjoyment and use of them and, at the same time diminish their value. As to the first, the enjoyment, it may be interesting to know that these flags are created in five symbolic colors. White is for iron, yellow for earth, red for fire, blue for water and green for wood. The flags are, at least in Bhutan, mostly erected on a hill overlooking a river. The idea being that the wind and the waters enhance the long journey. I was told, however, that these flags are useless - useless was the actual word uttered sadly as my friend shook his head from side to side - unless blessed by a monk. 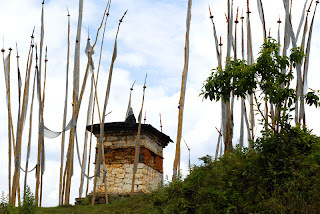 The most prayer flags I saw in Bhutan were atop Dochu Pass where not only a large shrine had been erected by the Queen but where also at least one monk was in attendance. These flags on one of the highest passes in the country were definitely able to set the prayers sailing on their way. I really do not know if this is, indeed, a "guy game" but as I came across it first by the sound of it- lots of enthusiastic male sorts of shouting and cheering - and because it took place in the bed of a large truck and because it is, after all, a gambling sort of game I do not envision kira clad ladies being big players. There is a toss of the die in a sort of cup thrown down on the leather pad, the gains and losses are shells. 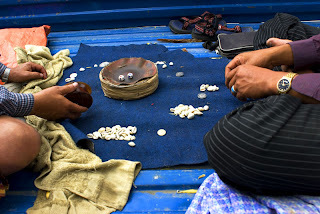 Alas I do not even know the name of this game or if ( though I assume - again - that it is) is common. What I do know is that it seems to be a great good time and that this playing of it, at least, attracted a fair number of spectators,. 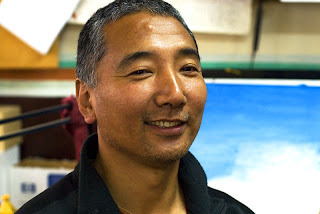 Kama, above, in his studio and in the doorway of the Art Shop Gallery, is the engine and heart of VAST. 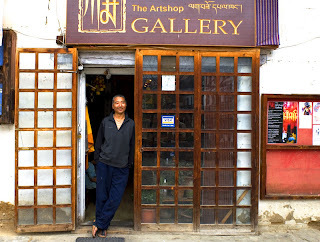 He is also a well known, well respected artist in Bhutan. I would like to tell you how broad his own out reach is but I am afraid that it is, indeed, too vast. 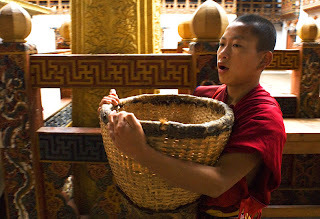 While I was there he was implementing a full out attack on the garbage issue in Thimphu ( there is daily pick up but, much as the case in the US was when I was very young, the people are not yet educated about dealing with refuse). 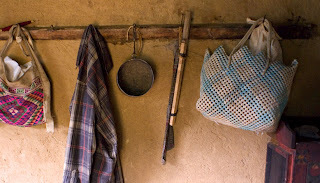 Kama was, as well, instrumental in getting bags of rice from India and distributing them to the families, who because their own crops are seasonal, do not have enough to eat during the winter. I was impressed with the social conscience of the VAST kids and have little doubt that a lot of the sense of responsibility for others and the environment originates with the values of the country itself. 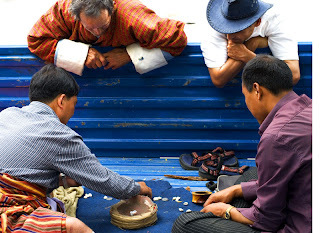 Bhutan is a we not a me country. That being said, I am equally impressed that these values are significantly enhanced by people like Kama. The group shot is in front of the prayer wheels in the main plaza of Thimphu. 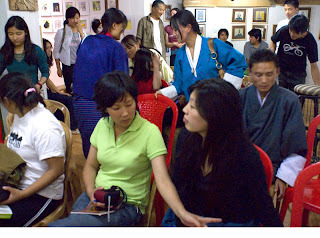 Back in Thimphu we gathered again for a one day workshop. The kids went out and shot in the morning and then in the afternoon we had a critique. In the first picture you will see in the background part of the VAST gallery created to display the work of the VAST students. 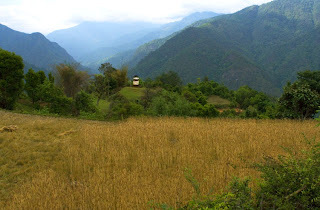 Above you see the chorten, the shrine, for which the village Chorten Neap is named. The first view is on the walk up to the village, the second is from the house. 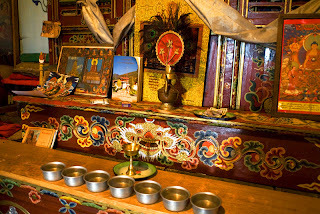 The interior of the house, typical of those around it, was simple with sliding wooden shutters and, while there was no furniture visible other than some cupboards for kitchen storage- one sits on mats on the wooden floor - it has it's own separate and elaborate altar room. Do you recall the daily water bowl ceremony as mentioned below?